You are here: Home » Featured » An Advent Tale: What’s On Fire? An Advent Tale: What’s On Fire? 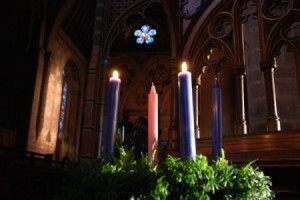 Dutifully, Catholics go on the hunt each year for the highly coveted, purple and pink candle ensemble vital to any serious Advent Wreath. I’m eighty-seven percent sure that I buy a replacement set after Christmas in anticipation of the following liturgical season, proudly lauding myself for thinking ahead, taking advantage of the sale price, and being prepared. However, I have yet to rediscover those candles in time for the first week’s lighting. Wherever it is that I put them, thinking it the most obvious place of all, has to date not yielded any candles. Each season, I get the creative bug and try to come up with new and ever imaginative ways to display our wreath. One year I thought I would suspend it above our dining room table. This appeared to be all well and good theoretically in an aesthetically pleasing sort of way. Why, it was even “pre-pinterest” in its clever application. Hovering almost angelically above our meals, it was a sight to behold. Functionally, however, one had to always remember to go low when passing the peas or pouring milk. I remember finishing up the dishes one evening when our son quizzically mentioned something about a fire. I gazed out into the vast expanse of desert that is arrayed behind our home and scanned the horizon. I didn’t see a fire. The fire isn’t “out there” someone screamed… it was the beloved advent wreath. Ancient history after dinner, the unattended wreath had caught fire as the candles reached the conclusion of their lives, and made contact with oil rich plastic products. Quickly reacting, we attempted to disengage the wreath from its mooring and gave it “the ‘ol heave ho” into the yard. There we watched it slowly burn out in a blaze of glory. Its demise was not in vain and has gone down in history, recanted each advent with hilarity and other odd memories of Christmas past. Other not so fond recollections involve tiffs that ensued between the “lighters and the blowers.” The timeless question of who gets to light, and who gets to extinguish was always a hotly debated topic for the younger kids. Once they hit the teenage years they no longer placed that kind of priority on the “subjects worth fighting about” list. It was with great wisdom I find, that the suggested prayers accompanying the lighting usually stipulate who gets to light when. I wonder if there was a long lost addendum that went into detail on the extinguishing that somehow vanished over the centuries. “On the evening previous to the lighting of the rose candle, the youngest female exerts her wee precious breath snuffing out the light.” Maybe that issue wasn’t a big deal in your homes, but I can assure you our kids made it one in ours. There were a few times we had to relight the whole lot to wrong the infraction and let the right kid have their turn. Oh, the things we parents do to make peace. May your homes this Christmas be filled with love, laughter and the light of Christmas. Quit Fooling, Mom. What’s Really Going On?